President Buhari tells supporters not to worry about defections – Royal Times of Nigeria. President Muhammadu Buhari on Thursday referred to defectors from the ruling All Progressives Congress (APC) to the People’s Democratic Party (PDP) as bad eggs. The President also urged his supporters not to be worried about the defections from the APC as he expects God to fish out the dishonest people in the party. 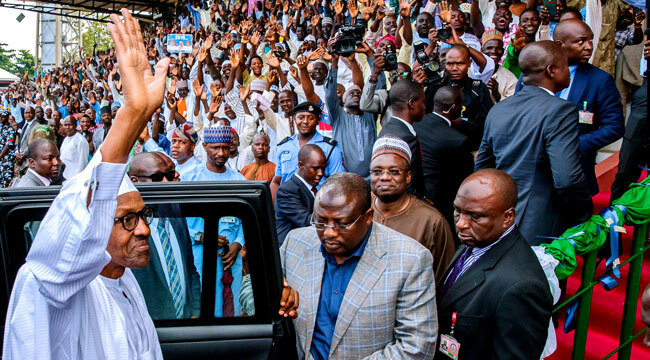 The President made the comment in Bauchi at a campaign rally for Gumau Lawal Yahaya, the APC candidate in the Bauchi South senatorial District bye-election, scheduled to take place on the eleventh of August. President Buhari who is seeking re-election in 2019 assured APC supporters in Bauchi said that his administration and the party has not forgotten their campaign promises and that they are working to exceed the promises. President Buhari also reiterated his resolve to ensure that nobody is allowed to loot the treasury. The President endorsed the APC candidate for the senatorial bye-election in company with the National Chairman of the party, Adams Oshiomhole, and the governors of Bauchi, Plateau, Kano and Imo states.